Paul Ryan told a room full of 400 donors at the Koch Brothers retreat in Utah that party elites are in a fight to retake the soul of the Republican Party. 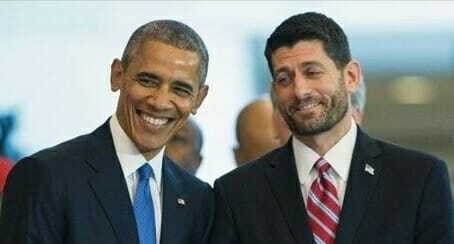 Ryan is hoping he can win back Republican voters with a message of globalism, open borders and political correctness. The donors gave Ryan a standing ovation after his speech. Speaker Paul Ryan (R-Wis.) told a donor audience convened by the billionaire Koch brothers that conservatives are in a fight to “retake the soul” of the Republican Party. “We have to do a better job of taking the moral high ground … showing [conservative] ideas in practice,” Ryan said on Monday. Ryan addressed a room of about 400 donors who have been gathered here since Saturday in a luxury resort at the foothills of the Rocky Mountains for the summer retreat of the Koch network, founded by billionaire brothers Charles and David Koch. The Kochs, who helm the most powerful financial force in conservative politics, are refusing to support GOP presidential nominee Donald Trump on both policy and moral grounds. Ryan didn’t mention the party’s nominee by name during his speech. But the Speaker, who endorsed Trump tepidly and belatedly, gave clear signals on Monday that he understood the despair with which many in the Koch network view the presidential race. “We have a different kind of nominee now,” he said, as the room filled with laughter. But Ryan said he was still getting out there, working to develop and promote conservative plans such as comprehensive tax reform.